Every day I am pushing my Passion Project ahead a notch. Working with a world's leading hand's-on publisher makes all the difference in the world, but there's no substitute for taking the initiative on the design side of things. 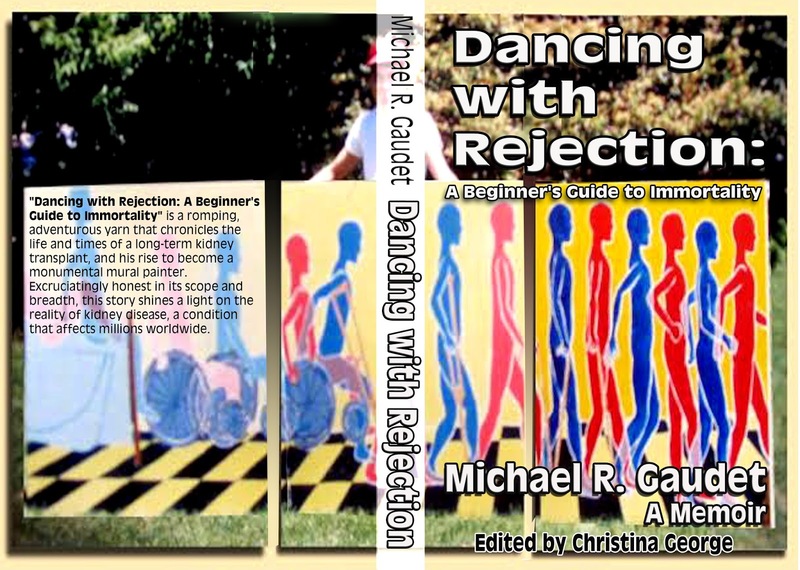 I've mulled over the design concept for the cover art re: "Dancing with Rejection: A Beginner's Guide to Immortality" and it was one of those pillow moments that changed everything. I thought, there needs to be some human touch on the cover, not so much the abstract, surreal image of the pill mosaic. My aim, as the graphic designer, was to come up with something eye-catching and impacting, but also extremely legible, above all else. There may very well be changes yet to come. Thanks for your patience. And then I thought, oh, how about the "Recovery" mural from back in 1979, when I was 19 or 20 years old? The human touch touch would've been a good idea, too bad I painted a bunch of weird red and blue androids. So I guess it isn't that human after all, but hey, it was created by a human, albeit a human in recovery mode after a near-death experience. Extracting from the back cover, "Dancing with Rejection: A Beginner's Guide to Immortality" is a romping, adventurous yarn that chronicles the life and times of a long-term kidney transplant, and his rise to become a monumental mural painter. Excruciatingly honest in its scope and breadth, this story shines a light on the reality of kidney disease, a condition that affects millions worldwide."